The way in which armies and garrisons were recruited during the Hundred Years War ensured that when peace broke out in 1360 there were large numbers of soldiers, unemployed and without prospects, loose in the realm of France. These banded together, forming independent companies who made war on their own account, seeking to keep themselves fed and paid. Whilst most of these routiers were reabsorbed into the English and French forces for the Castilian campaign and the resumption of hostilities in 1370, a substantial number had made their way south, entering a new theatre: that of Italy. Here they joined Italians, Germans and other professional soldiers as condottiere, men under contract. perhaps the most famous of these was Sir John Hawkwood. It is probable that, after initially being apprenticed as a tailor, he began his military career as an archer in the Breton campaigns of 1342-43, perhaps serving alongside his neighbours in the retinue of the Earl of Northampton. He may have served in the Hundred Years War on the Crécy campaign in 1346 and at Poitiers in 1356, but he does not appear in the sources until the Treaty of Brétigny brought a temporary peace between France and england in 1360. Hawkwood was a member of the largest of the bands of unemployed soldiers that ravaged France during this period, the Great Company, which focused its attention on the city of Avignon, home to Pope Innocent VI. Here they effectively held the pontiff to ransom until they were bought off and split up, part heading for the war in Castile and the rest crossing the Alps in Italy, serving Innocent in his war against the lord of Milan. Hawkwood went to Italy, serving as one of 19 corporals – the term used for a fully armoured man-at-arms – in an English company under the command of the German captain Albert Sterz. They quickly gained a reputation for fighting on foot, with a ferocity unusual for foreign mercenaries, being highly manoeuvrable and having a talent for night attacks, traits that Hawkwood was to continue to show throughout his career. They also became known for rapaciousness, supplementing their contracted income by raiding the lands and extorting money from the towns through which they passed. In 1363 the White Company, as this band was called, was contracted by Pisa for its war against Florence. After the initial successes, in which the company once again proved itself, the city of Pisa elected Hawkwood to be captain of their entire army. From here his career went from strength to strength and, whilst not always militarily successful, the captain nonetheless showed himself to have a good strategic eye. 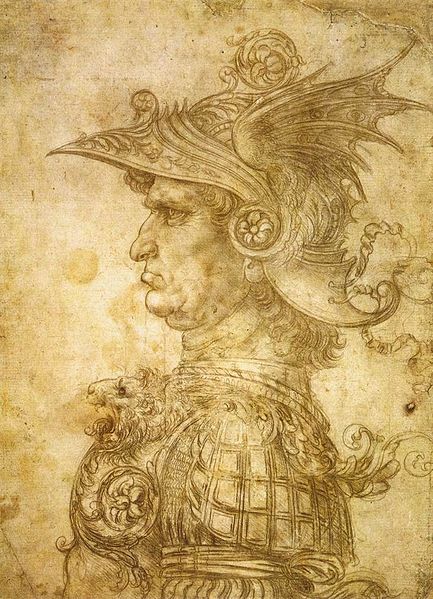 He also showed great cunning (perhaps the origin for the Italian rendering of his surname, Acuto, meaning ‘the sharp or astute’), a quality essential in the politically charged warfare of Italy. The same astuteness was to serve him in good stead personally. He was as able to intimidate and negotiate a victory as win one on the field, and used the same tactics for his own personal gain – cities that failed to be his friend often paid the price when his companies raided their territory. Moreover he was able to ride the currents of Italian’s shifting alliances for his own personal ends. 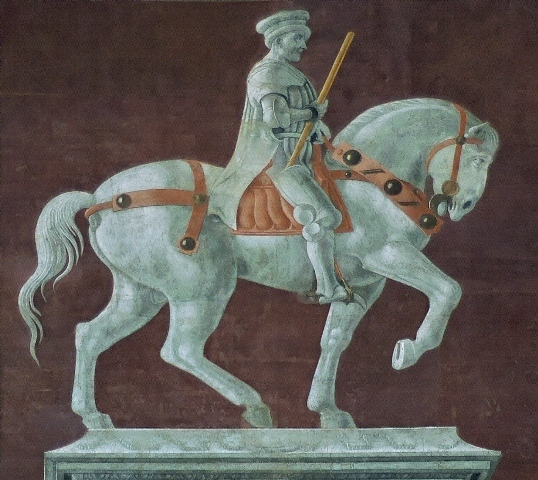 He switched allegiance from the Duchy of Milan to the Papacy in 1372, and returned to the duchy’s service in 1377, and finally contracted with florence to lead its armies in 1390, his victories there earning him a heroic reputation as the city’s saviour. Every new contract ensured greater profit and honours. Hawkwood’s success netted him a huge income and extensive property. In 1381, for example, he earned 67,533 florins, only about 3,000 less than that generated by the city of Lucca, with its population of 30,000 people, in the same year. The money was lent to his comrades, spent on supplies, but also invested in the cities for whom he served and the properties he owned in both Italy and England. Hawkwood never ceased to be a servant of the English crown. Throughout his Italian career he maintained close contacts with England. His contracts invariably included clauses barring him from being engaged against the allies of the English crown. He participated in the arrangements for the marriage of Lionel, Duke of Clarence, Edward III’s son, to the daughter of Bernabò Visconti, the ruler of Milan, and he acted as Richard II’s ambassador in the region, negotiating with almost all the major players in the area. In the last years of his life he prepared to return to England, but died before he could do so. 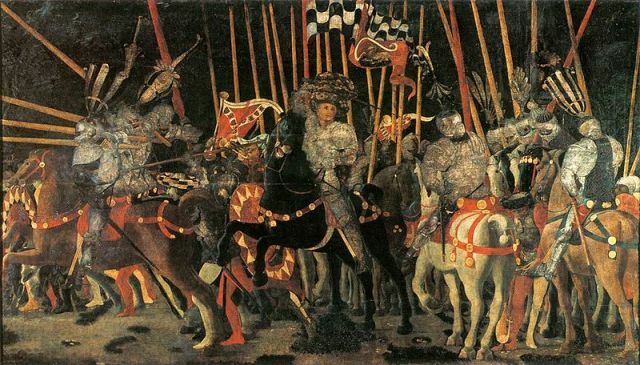 Richard II tried to have his body returned, but in the end he was buried in Florence beneath Uccello’s famous painting. Looking at it there is little to suggest the Englishman who had started his life as a tailor; Uccello’s Hawkwood is every inch the Italian captain. I am working on doing a historical documentary on John Hawkwood and would like to get in touch with the writer of this article, Robert Jones. Please email if he is willing and also if you have any images i could use for my film please send those as well. I am really sorry not to be able to help you. I just used the excerpt from the book written by Robert Jones, but haven’t contacted him ever. As for images, I’m not the owner of the rights, most of them come from Wikimedia Common (Paolo Uccello’s paintings are good source for the period).